Mainely Write: The End or the Beginning? Hope your week has been special! Ours has been. And Happy New Year! I am hosting today's lineup of poets and poetry lovers. Please, if you have some poetry to share, leave your link on Mister Linky below. Please, if you just love poetry and don't have a poem to share, but just want to read poems, poems and more poems, click on a link and go to there... and hopefully leave a nice comment for someone to savor. Well, the end of the year is here, an we are at a new beginning, in a new home, in a state in which we've never lived before. I am totally turned around when I go out and about. How long will it take to know where I am??? I'd always said that it was easy to know where you were in Maine. Go east - you are in the ocean. Head north and northeast and you are in Canada. Head west or south and you are in New Hampshire. There aren't a lot of roads, so if you are on one, just stay on it and you will get somewhere. Get off the road and you will be lost. Stay calm and on the road, and you will get where you are going. No one cares how long it takes to get there - it is going to take a while to get there no matter what you do. When we first moved to Minnesota, my husband would drive us most places. It was before GPS and cellphones. He loved driving around. So every night we would go on a drive, and he would bring me home by a different route. I had no idea where we lived for quite some time. Lol! I am feeling a bit like that again, though with the mapping on the phone, I at least know how to get there and back! I still can't do it without the mapping. If I lose signal, I won't have a clue how to get home and I'm not sure if the "stay on the road and you will get somewhere" will work in Pennsylvania. I could end up in New York or DC. I thought I'd share with your a few of the angels outside our new home. I think this last one is my favorite of all the angels in and out of the house that I've discovered. It has been fun to find angels, fairies and little creatures hidden in tucked away places here. and reads what's carved in stone. but turn their heads and smile. I'm glad that he stopped here. Well! You have much to discover in 2019. I wish you a good set of shoes, a sound GPS and a hearty sense of humor. Please drift toward DC on one of your wanderings. It's a great town. I can't help but to love your reading angel. What a sweet little cherub with a book. I hope your home is surrounded by the peace of angels and that you enjoy getting to know the new area with a sense of peace. Thanks so much for hosting this week. I'm scratching my head and thinking hard on my OLW for '19. It's tougher this year...being an odd year. I like even numbers better. But, I'm sure I'll settle on a word by Jan 1st. 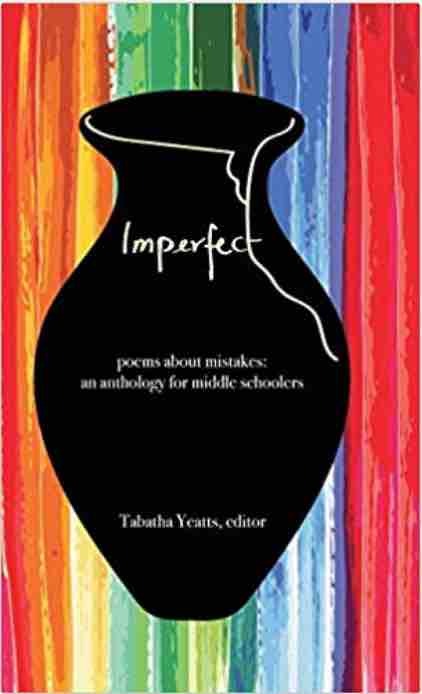 In the meantime, I'm celebrating the short....with a few ditties that came out of Laura Salas' 15 words or less challenge. Why are odd years more difficult? Just wondering if that is why I'm having trouble coming up with one! You know, I was thinking the same thing! Gives me comfort that this is where I am supposed to be at this time. Getting to places in Maine sounds a bit like Chicago–we could swap, or maybe that's one of the reasons I always have liked Maine so much. In Chicago also the lake is east, and I always navigate by it and feel lost without it. I also like having angels around, and these are all lovely as is your "Reading Angel" poem. Wishes for a Happy New Year Donna, to you and your family, in your new area! Ha! It was easy living in RI, too! It was like living in a box! P.S. And thanks for hosting the roundup this week! Linda, your angel collection brightened my night so I must thank you for your reading angel poem. That angel and his wings have a beautiful resting place at your new home. May your GPS take you to wonderful sites as you travel peaceful miles. Now that you are settled in PA, I am sure that 2019 will bring you great joy. Thank you for hosting today. We are settling in slowly. My husband just went back to Maine overnight to grab some more furniture. Fortunately, the woman who sold us the house left all the window treatments (I'd say curtains, but the windows in the dining room have 8 layers of lace and brocade panels, valances and swags), a host of angels, Christmas decorations, kitchen table and chairs, silverware, a couple of beds, a recliner, and all the sculpted carpets. She also left a few mice...but we are conquering them. I love all your perfectly charming angels! Your poem is delightful. It sounds like you will have many wonderful new adventures this year in your new home! What do you think? Adventure. My new OLW? It is something my mother used to tell me whenever I would embark on something scary or uncomfortable for me..."Think of it as an adventure, and see what you can discover." This is my ADVENTURE. Thanks. I'm going to try that out today. See if it sticks. and never feels alone." Thanks for hosting and wishing you all the happiest of new years! 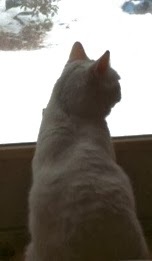 We have so many birds, rabbits and squirrels out here. Our small yard is listed as a Certified Wildlife Sanctuary... so I was tickled when that line trickled out! Wishing you a very happy 2019!! Donna, I loved your musings about finding your bearings in different locations, new and old. Then I was enchanted by your hidden angels. Your grandchildren must also adore them! What a warm welcome for all of you as you build your new home at the end of an unexpectedly twisty and bumpy road. Your angel poem is delightful--"He savors words and reads to birds/ and never feels alone." 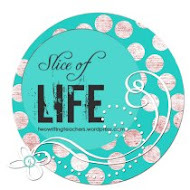 Now that's a recipe for a rich and contented life! Thanks for sharing and for hosting this week. I can hardly wait to see them in spring when the flowers all bloom around them! Thank goodness for the maps on the phone! I hope there's a wee angel hidden somewhere to help you find your way around. Thanks for the sweet poem and for hosting! Those maps on the phone are great as long as they work and I have my reading glasses! Thanks for hosting and for sharing your hidden angels - what a wonderful discovery! Even kitchen cabinet drawers had angels...it was fun discovering them as we worked around the house. Wait--you moved to Pennsylvania? 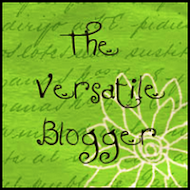 But this blog is called Mainely Write! I'm so disoriented. : ) I love your musings on finding our way. Your poem is positively charming, just right for the provenance of your reading angel! "He savors words and reads to birds" made me smile. Happy new year! Lol! I was thinking of how to make my header easier to read..."MainelyPennWrite? MainelyPennsylWrite? from Maine to Pennsylvania". We will return to Maine, probably in a couple to three years - but then again, who knows? Who needs plans when you are retired? Donna, all the best in your new home. Your "wings have brought you to this place." The angels are fabulous--I don't know how the last owner could have left without them. The sleeping one in a bed of moss, I found most touching. Keep discovering and keep writing and keep your eye on the road ahead. The sleeping one is really sweet. He's resting in the garden area, and I'm anxious to see him napping in the flowers of spring and summer. Well angels we have heard on high! What a fun collection, and I know they are keeping an eye out for you, Donna. I can only imagine what an adjustment this must be. Not sure if I could be land-locked. But...I have always enjoyed trips to and through PA, so I'm sure you will have fun exploring and then sharing with us! Happy new year! Land-locked for me is a problem, too. I have bouts of homesickness just like I did when we lived in Minnesota for a while. I grew to love it though, so I'm sure it will happen again! 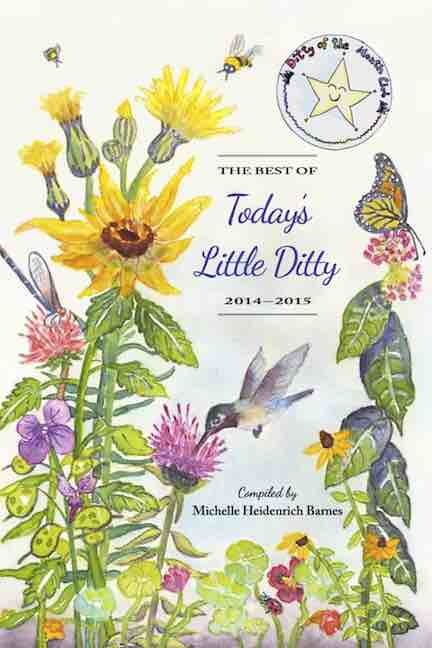 Donna,isn't it wonderful that your Poetry Friday friends can accompany you wherever you go? Best wishes as you acclimate yourself to new geography and new surprises, all in the company of angels! I do love them all, but the book angel feels very special. Such an expression of delight while reading! I laughed at "and reads what's carved in stone." We all know the long road to words carved in stone, and even then we often want to go back and change a word or two! Your poem is delightful, and thank you for hosting in the midst of settling. I am relieved to learn you have kept one foot in Maine! It is absolutely amazing when you think about it. There have been quite a few geographical moves this past year for the Poetry Friday community. But we can still get together, no matter the miles and changes! I didn't know you moved. What an adventure! I love your reading angel poem. You have such a talent with rhythm and rhyme. And that ending, "I'm glad that he stopped here" is just right! I see this little cherub every time I come home. Makes me smile. I sent you an email. Thought I had you on my mailing list, but didn't. Here's to a year of discoveries, adventures, and angels around every corner! Thanks for hosting our year-end roundup! I am up for this new adventure! It was touch and go for a while, but now...let the adventure begin! Thank you. I enjoyed your poem and now I want a reading angel. 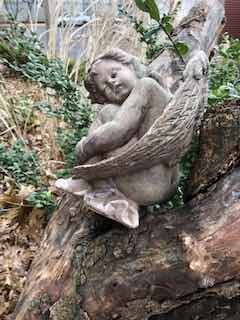 I had several angels in my woodland garden. They provide smiles, a moment of silent prayer, and you know they are watching over, the animals that live there. Have a blessed 2019. Everyone should have a reading angel! I never had lawn ornaments before, but I love how she has these tucked in beautiful spots around the outside of the house and in the gardens. Very peaceful. Wow! Seems like you have lots of new adventures in store! I love that you have brought your angels with you! 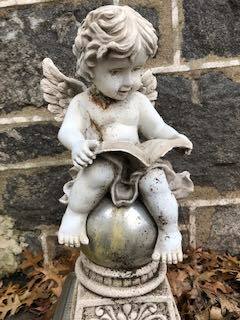 I want a reading angel for my yard! These angels were all left here to discover! And there are more angels left in the house, along with other trinkets inside and out. Seems like every day we discover a new treat! Thank you for hosting today, Donna! 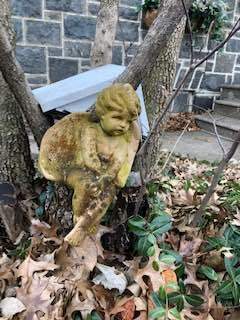 How generous of your home's former owners to leave their collection of angels to you. They are wonderful, and I adore your "Reading Angel" poem. Happy New year, and best of luck to you in your new home! She was a sweetheart! I will show more angels next week, I think. Thanks for hosting! Happy holidays to all, and happy new home to you! Thanks for visiting! Happy, happy 2019 to you! Thanks for hosting this week. I am originally from PA! I hope you enjoy your time there. Hearing about your home in Maine makes me want to devise a reason to move there! Hope that 2019 beings you lots of happy surprises and refreshing motorcycle rides. The motorcycle season is noticeably longer here. One of our neighbors and his wife ride (together), so maybe they can show us some good roads. I'm excited to be able to ride more of the year. I love your reading angel poem. It fits so well with the image you included. I see you have a collection of angels that grace your new home. It very inviting! Thanks for hosting! (Carol at The Apples in my Orchard on Wordpress. Blogger has me registered under a different email. Thanks, again. Thanks, Carol! The angels, fairies and other creatures are really a fun collection. That reading angel is perfect for you! Wishing you and your family much happiness in your new home. I love all of your angels and your reading angel poem. 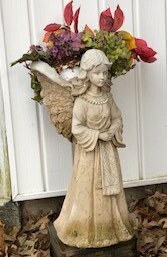 Good luck in your new home--glad you have angels and fairies to watch over you. They are fun discoveries. Spring should make them really happy! Thanks, Amy! We have high hopes for this coming year!